It's that time of year again and it's beginning to feel a lot like Christmas. You know what that means, those of us with traditional 9-5's are bound by the rules of politically correct office engagement and must commit to a bit of Christmas affliction. Picture it, your office 2011, and little Miss Patty Polly Anna rolls around, with her chipper self, with a Santa hat full of names. You see her out the corner of your eye and begin to scatter to look busy. Oh no, that's not going to deter little Miss Patty Polly Anna, she heads to your cube anyway. Miss Patty Polly Anna, "It's that time of year, let's spread some office cheer". Miss Patty Polly Anna, "Come on, it's fun, it'll put a wiggly in your tiggly". You reluctantly grab a name out the wretched Santa hat and see that you've pulled Betty Back Stabber's name. So now, you're stuck participating in Patty Polly Anna's annual foolery, you've drawn Betty's name, you hate her and it's all going to come to a head starting Monday. Well, you have two options; participate or not (don't forget you still have THAT name). From my point of view, I absolutely loathe the Secret Santa exchange. No one ever follows the rules. People get what they want to get you without following the guidelines on the questionnaire. The gifts are always re-gifted from 1923 and it usually smells of smoke and pets. One year I got fuzzy socks and leaky Bath & Body Works. Everybody knows that I am NOT a fuzzy sock kind of girl. 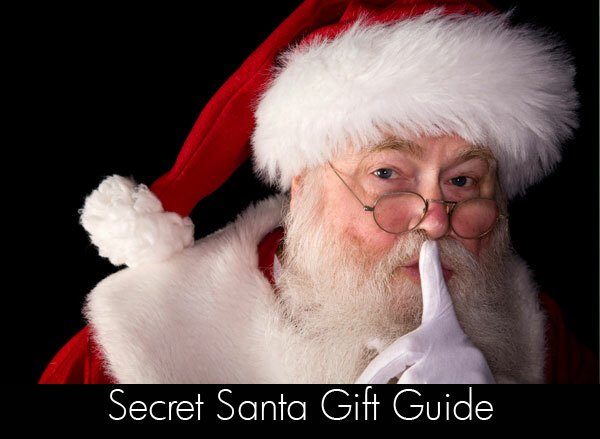 Do you participate in the Secret Santa exchange at your place of employment? Is it any way to make this event pleasurable for all? My family does it every year. I have done it at work, but the gift were a little strange - men mostly buying women what they wanted to see them in!!lol. Anyway, a family secret Santa is great as we all stick to the rules. I don't like the children thinking they have to buy expensive and a lot of gifts and so this helps them to feel good about buying presents without the pressure. If we did not have secret Santa, the children would spend far too much. We have a maximum of £20. We write a list of three items and the person just selects what they want to buy. Glad to have found your blog. I don't like that exchanging of the names I stopped a long time ago. My hubs family does it but I don't participate the hubs just pulls a name and buys for me. No one ever follows the rules and people don't get you a nice gift when you always give one. The last time I participated someone got me a jewelry box I politely asked for the receipt so I could take it back and get the money. I thought I was the only one that hates the Secret Santa game!! I don't participate in Secret Santa at all to keep the confusion down. Absolutely hilarious post. I'm sitting here in near tears laughing at your summary. I agree - it's foolery already and then you are unlucky enough to pull the completely wrong name. Too funny! I do not partake in the Secret Santa shenanigans at work because of all the same reasons listed above. People don't follow rules and while I go out of my way to get something nice, I end up with Christmas bell earrings....No Maam. There is a way to make these kinds of holiday activities fun! I always say that the item you purchase for someone else has to be from a second hand store. This makes it fun because people either great great designer stuff at second hand prices, or people give really ridiculous things like sequined miniskirts to their male co workers. Its a blast! Just started following your blog, would love if you could check mine out as well! I haven't had a 9 to 5 gig in ages, but my last Secret Santa experience was horrid!!! I had told my name puller exactly what to get me, and he did, but I was a little late to the party and my boss decided to do a random gift exchange, so someone else ended up with my gift. How rude!!! Welcome Don, Salt and Tia. Thanks for visiting. I wish I didn't have to bother with this year after year. Hopefully in 2012, I'll be my own Santa so there won't be any secrets. Welcome Nina, I believe it's your first time as well. I've actually don't a Secret Santa with the family of my ex. Ewww and horrible. I got a long silk leopard nightgown. That's so not me. LOVE your new layout..too awesome! we just completed our exchange today and it was awesome...i got what i asked for which was nice. My family all exchanges presents by drawing names at Christmas -- Kris Kringle. It's a fun tradition, but it gets a little repetitive, so we have started doing Rob Your Neighbor, too. That's way more fun! girl, you and i have had this convo over twitter - uhmmm. this year, i just wrote one thing to make sure i get it! no more jar of those easter egg looking milk chocolate stuff, spoon rests, box of candy cane and chocolate liqueurs. Those milk chocolate candies will go right in the trash. I'm still cracking up over the spoon rest. I'll probably get that with the candy canes, hand made pot holders, and anything else that falls in the ratchet Polly Anna category. LOL...this depiction scares me!!! Thank goodness we don't do this at my job. *wipes perspiration from brow* Instead, we have a potluck holiday party. That's also difficult because I don't know who keeps a clean kitchen and everyone "suggests" you try their dish. I keep a tums around just in case. We don't do it in my office, thank goodness. I do it with a group of friends, and I'm doing one with a group of bloggers. For those 2 exchanges I am excited. Random foolishness from folks in the office that you have to smile at? Not so much. @Jasmine - Thank you! That's such a huge compliment. Maybe next year, we can do a blogger exchange. @MrsTDJ - a blogger exchange sounds excellent. Please let me know how things go. LOL - Secret Santa stories tickle me each and every time.